Watson and Holmes continue from last issue to find Shon’s missing girlfriend, and more clues to a bigger mystery and danger than expected. The creative team of Karl Bollers (writer) and Rick Leonardi (artist) return to bring us the 2nd issue of this series about an updated urban version of Sherlock Holmes, from Brandon Perlow’s New Paradigm Studios. 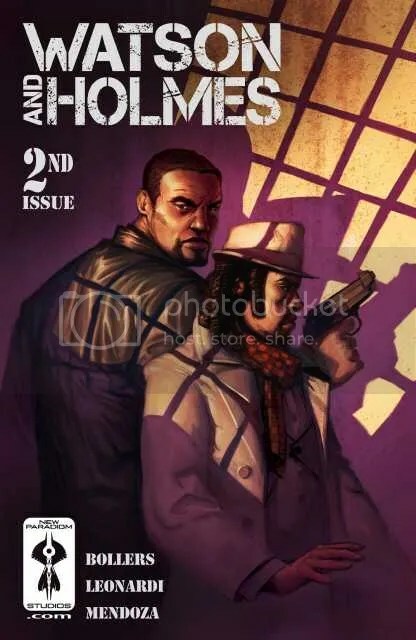 Picking up right from where Watson And Holmes #1 left off, we get right into the action as our heroic duo kick in the door of a warehouse where a girl named Trina is being held at gunpoint by a mercenary. Thanks to Holmes’ observant nature, they rescue Trina, but a foot chase and gun fight through the city streets ends when the mercenary is mysteriously shot dead before he can give Holmes or Watson any answers about who he works for. Splitting up, as Holmes goes off to look for clues on his own, while Watson heads back to the clinic to begin his shift, the rest of the issue continues unfolding the mystery of the case, with the same level of drama and intensity as before. Seriously, I felt like I was watching a movie as I read this comic, that’s how engrossing it is. We get a brief glimpse into Watson’s private life via a phone call he makes to some woman (Wife? Girlfriend? Ex? Baby-Mama? ), and see more of Holmes’ interactions with local authorities (we meet Lt. Leslie Stroud, perhaps an update on Inspector Lestrade? ), and more exambles of his deductive skills, slight-of-hand, and general intelligence (he invented a spray which can detect fingerprints on touch-screens, enabling him to find someone’s computer password). A seemingly random murder mentioned briefly off-panel in the first issue is brought to the forefront this issue, and it ties into this current case, and leads to our heroes witnesses a murder being committed live via webcam, by the same mercenaries who had kidnapped Trina. Watson and Holmes are once again on the trail…but first Holmes suggests that they stop for lunch. Much like everything else about this case, and the way Holmes handles it, I have no doubt that the cliffhanger is far more than what it appears to be. This serious is off to an awesome start, with the 2nd issue holding the same level of quality as the first. As I said before, whether you’re a Sherlock Holmes fan or not, you really should check this out. Chacebook gives it 5 STARS.